For most Canadians ice is something to skate on, fish through, serve with your favorite beverage or needs to be heavily salted and sanded after a storm. Nowadays ice seems to either be a luxury or a nuisance to us. The earliest record of harvesting ice was written around 600 BC in northwest China. It was harvested in the winter months and stored for use in the summer months for refrigeration purposes. Over the next 1000 years not too much changed with ice and the harvesting of it. 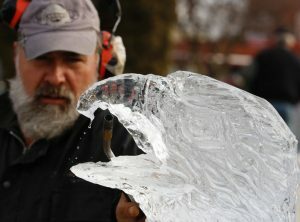 Michael Tuinstra, of Cambridge, works on an ice sculpture during the Ice Sculpture Competition in Lakefield. 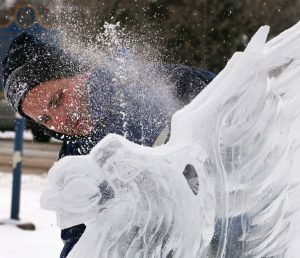 The event was held as part of Polar Fest in Selwyn Township. In the 1600’s Chinese peoples in the Heilongjiang province, began making lanterns out of ice to illuminate the long winter nights it wasn’t long before people started hanging these lanterns outside of their homes as decorative pieces. Before long these decorative pieces grew in size and began appearing as large decorative show pieces. 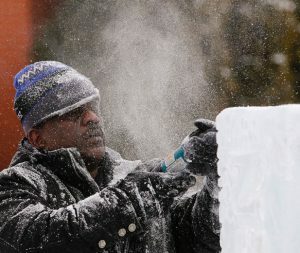 There seems to be some dispute as to whether China or Russia should be credited with starting the first ice based festivals. Seeing as the region where these traditions started were in the same general area with a border running through them I think it would be safe to reason that these carnivals grew to be a part of regional traditions. The trend spread, and people started hanging decorated lanterns from homes and parading them in carnivals. 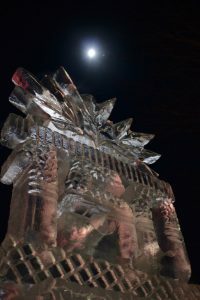 The first large scale ice sculpture was of a palace created entirely out of ice in Russia in 1740. Highlights of this monumental piece included cannons that fired cannon balls of ice, and an icy elephant that sprayed water out of its trunk. Ever since the creation of this palace communities throughout China and Russia have been constructing entire towns out of ice. Ice has been incorporated into many cuisines for its decorative accents. Most famously Chef Auguste Escoffier first presented the traditional Peach Melba dessert nestled in a dish that looked like a swan which was completely carved out of ice. Since this time chefs have plied their craft at making ice sculptures to decorate their buffet tables. This is exceptionally present on cruise ship buffets. As a chef I enjoy sculpting ice as it allows one to create temporary works of art that are very pleasing to the eye. I truly enjoy the fact that no matter how beautiful or big the sculpture we know that it will ultimately end up as a puddle of water. An ephemeral expression of art. 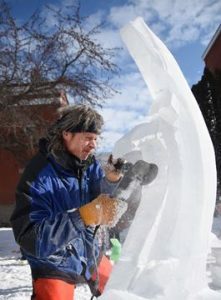 The ice blocks that I choose to carve are specially made, they come in 300 lbs. blocks and take three days to form. The water is continuously agitated during the freezing process producing crystal clear ice, without any pressure cracks or bubbles forming in the blocks. As well the water used is food friendly and can be ingested safely. Some carvers use lake water which works equally as well as the factory formed blocks, the downside being that bits of debris can be trapped in the ice, as well it is advisable not to ingest untreated water from our lakes. Once I’ve decided on a design I draw a one dimensional paper template of what I intend to carve. I then etch the template into the ice. From here I use a chainsaw to remove all of the large pieces of ice that will not be needed in for the sculpture. Then using any of the following tools chisels, irons, grinders, drills and blow torches I begin to transform what began as a one dimensional drawing into a 3 dimensional sculpture. 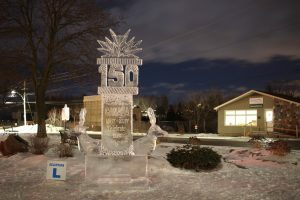 We celebrated the 13th Annual Polar Fest Ice Sculpting Competition in Lakefield Ontario this past weekend. There were a dozen professional carvers on hand competing for the People Choice Award and the Carver`s Choice Award. This annual event has been sponsored since its inception by the Lakefield Village Merchants. Posted on Monday, February 6th, 2017 at 2:28 pm	and is filed under Ice Sculptures.